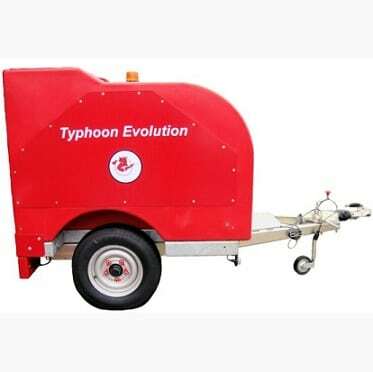 The Typhoon Evolution range was developed to satisfy the demand for a standard Typhoon to be fully covered to reduce noise and to carry sufficient water to operate for one hour away from a water source. The latest design has tanks which are made from rotationally moulded plastic and are light weight but maintain strength. Twin baffles are moulded into each of the tanks. The covers are made from 3mm aluminium and incorporate a forced air ventillation system to remove heat from inside the machine. The twin 500 litre capacity tanks are linked with water entering one tank and sucked out of the other tank to provide a natural flow of water around the system. This is the perfect cleaning solution for cleaning in public areas, including street cleaning, shopping centres, holiday centres and parks.